A workshop was held recently to help participants read old Malay manuscripts. A call for papers related to history, anthropology, heritage studies and other social sciences relating to Malays. This journal published by the Malay Language and Culture department of the National Institute of Singapore, Nanyang Technological University is calling for papers for the second issue to be published at the end of the year. The deadline for submissions is 30 July 2009 and details can be found here. E-Utama is an annual online peer reviewed journal dedicated to the publication of interdisciplinary, theoretical and review articles of high scholastic quality in Malay education, culture, language and literature. The purpose of the journal is to bring together scholars and researchers from all areas of Malay Studies to stimulate the exchange of ideas, opinions and critical inquiry between these groups. The journal is published by the Malay Language and Culture department of the National Institute of Singapore, Nanyang Technological University. The articles published in this journal seek to showcase innovative scholarship in the area of Malay Studies. E-Utama aims to foster Malay research, but is not exclusively Malay, having an international authorship, readership and a collective of international peer reviewers. The editorial practice is to promote and include multi and interdisciplinary work and the journal accepts papers from a wide range of disciplinary areas in the Humanities, Social Sciences and Educational Pedagogy pertaining to the Malays, including, but not limited to: Philosophy, History, Sociology, Anthropology, Psychology, Feminism, Media and Communication Studies, Cultural Studies, Gender Studies, Policy and Management, Geography, Economics, Political Science, Literary Studies, Legal Studies, Social Theory, Law, Education, Theology, Multicultural Studies, Globalisation, Labour Studies, Postcolonial Studies, Visual and Performing Arts, Archaeology, Heritage Studies, Race Studies, Science and Technology, Development Studies. The basis for accepting papers for publication is the agreement among three reviewers (via a double-blind review process) that they show relevance, compelling justification for study, subject mastery and originality in any of the major sub-areas of Malay Studies. 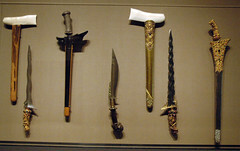 A number of priceless antique weapons were stolen from the Malaysian Historic and Ethnography Museum in Malacca, Malaysia over the weekend, chalking up a loss amounting to “millions of ringgit”.